Buddhist Festivals are the days for joy and celebration commemorating some significant events related to lord Buddha. Apart from religious significance, Buddhist Festivals also imparts an opportunity for the people to meet and indulge themselves in Buddhist meditation in local temple or monastery. The principal Buddhist beliefs celebrate 'the Three Jewels', the Buddha, the Dharma (the Buddhist Teaching), and the Sangha (the spiritual community). 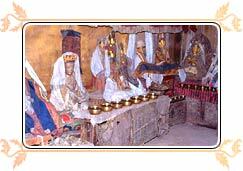 It is difficult to establish when Buddhist philosophy or religion was introduced into Ladakh. It is however definite that its first influence was under the reign of the Emperor Ashok. The true representative of the ancient practices and artistic traditions of Buddhist prayers, dating back to over a thousand years are the monasteries. These Ladakhi monasteries are excellent examples of Tibetan architecture and impart the special impression of living a moment of eternity to all its visitors. Many of the annual festivals of the monasteries take place in winter, a relatively idle time for the majority of the people. These festivals are a colorful events that take the form of dance-dramas in the Gompa courtyards. Lamas or Buddhist monks, robed in colorful garments and wearing often startlingly frightful masks, perform mimes representing various aspects of the religion such as the progress of the individual soul and its purification or the triumph of good over evil. Some of the major festivals of Ladakh are Hemis festival, gu-stor, losar, phyang tsedup, sindhu darshan festival, matho nagrang, monastic festivals, stok guru tse-chu, dosmoche, yuru kabgyat, galdan namchot. All Ladhaki Buddhists celebrate these festivals (one will also find their mention in Buddhist philosophy books) by making offerings to the gods, both in the gompas and in their domestic shrines.